A stablecoin is a cryptocurrency that has stable value. The concept of stablecoins was conceived from the notion that the high volatility of Bitcoin, Ethereum, and other cryptoassets prevents the typical person from using cryptocurrencies to spend or invest. 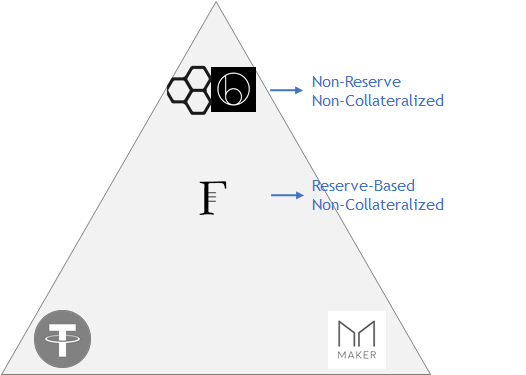 Existing stablecoin projects are limited to a collateralized model. Only two main types of stablecoins are being used: fiat-backed and crypto-backed. Fiat-backed stablecoins are tokens that are backed by fiat currency, e.g. Tether, which is backed by USD. Crypto-backed stablecoins are tokens that are backed by other crypto, e.g. Maker Dao, which is backed by ether. But in many ways, these models are flawed and backward-looking. A fiat-backed model requires holders to trust that every token will actually be backed by fiat money. This creates a huge counterparty risk to token holders. On the other hand, a crypto-backed model is inefficient and is tied to the existence and volatility of another crypto. This creates opportunities for “non-collateralized” stablecoins, aka stablecoins that don’t require any backing. If executed well, this type of stablecoin will unlock rich possibilities for crypto holders since it will be decentralized, efficient, and free of counterparty risk. The approach is promising, albeit in need of testing. Currently, there are three projects working hard to bring this idea to reality. Yet while they share the same core concepts, their underlying mechanics are significantly different and are key to evaluating how their respective tokens will perform. In this post, we’ll evaluate the mechanics and risks of existing non-collateralized stablecoin projects. If you’re unfamiliar with the different types of stablecoins, you can read this post for background. In economics, price is at equilibrium when supply equals demand. A mismatch in supply and demand will lead to a movement in price. When demand increases or supply decreases, the price rises. For example, the chart below shows pizza prices achieving equilibrium at $3; and if demand rises, the price per slice also increases. This price instability is not good as it inhibits purchasing behavior. Therefore, the central bank’s job is to manage the supply of money in the society to match the demand in order to keep price instability in check. Let’s say a token is pegged at $1. If demand decreases, the token price will drop below $1. The protocol will then contract token supply by taking tokens out of circulation, pushing the price up to $1. If demand increases, the token price will rise above $1. The protocol will then expand token supply by minting new tokens, bringing the price back to $1. Decreases supply by issuing bonds. Token holders bid for bonds in an auction by specifying the price they want to buy the bond in Basis, typically at a discount to the market price of Basis token. Increases supply by distributing new tokens to bondholders and shareholders. If the number of tokens that needs to be issued is more than the number of bonds in the market, the leftover tokens will be distributed to shareholders. Decreases supply by issuing Carbon credit in an auction. In essence, the credit are like bonds in Basis protocol. Token holders bid for the credit by specifying the amount of CUSD they are willing to burn in exchange for the credit. The credit gives the right to get a new coin at a discount in the future rounds of expansion. Increases supply by distributing new tokens to credit holders on a pro-rata basis. Decreases supply by issuing bonds. In normal times, token holders bid for bonds in an auction. Each bond entitles holders to redeem $1 worth of FRG token in the future (like Basis). But, in volatile times, the reserve would step in to bid for bonds instead, thereby shielding holders from abrupt contraction. Increases supply by splitting tokens to bond holders, including bonds held by the reserve. If all the bonds are redeemed, FRG in the wallets of token holders will be split automatically. Although every project has institutionalized reward systems to incentivize token holders to join the auction, Carbon gives the highest upside gains from expansion. For Basis and Fragments protocols, the upside for token holders is limited to $1: since each bond entitles holder to redeem only $1 worth of token in future rounds of expansion, token holders would earn returns on the difference between the bid price and face value of the bond ($1). Alternatively, the pay-off to Carbon credit is not capped to one token, but could be as many tokens as needed for that expansion period. What about Basis shareholders? As a shareholder, you’re entitled to get leftover tokens once all the bonds are redeemed, which equal unlimited upside! Yet I’d argue that this model is not without cost. The fact that shareholders are entitled to benefit from supply expansion even though they don’t participate in the auction means that they are essentially “free riders.” If the Basis protocol keeps expanding more than the amount of bonds issued in the auction, the tokens will go to shareholders. This could lead to tokens being concentrated in the hands of people who do not actively put in effort to stabilize the protocol. Free riding leads to non-production, and that’s when it becomes a significant problem. This scenario creates a Prisoner’s Dilemma where shareholders are incentivized to remain idle and not return new coins into circulation. Basis bond holders do not have protection against loss from being written off. When token holders bid for Basis bonds, the bonds will go into a bond queue. Basis bonds are paid off in a first-in-first-out manner and are written off after 5 years. This creates a problem when there is sustained contraction as the queue could become too large. Token holders who help the protocol in the early phase of contraction will not be rewarded as their bonds could be written off. On the contrary, Fragments does not retire its bonds, but redeems bonds randomly. This is not directly beneficial to early participants, but it is a simpler way to solve a problem of bond queues while not creating unforeseen negative consequences. Because the bonds will certainly be paid off, token holders are fully incentivized to help the protocol contract token supply as their loss is limited to zero. Fragments holders can enjoy limited downside while still benefiting from gains during expansion, creating a payoff like buying a call option. Both Basis and Carbon rely on market makers and token holders to maintain the peg by buying/selling tokens or joining the auction to facilitate contraction. In volatile times, these players may be reluctant to step in to restore the peg, exposing the protocol to a death spiral. Let’s think of an extreme case. What if no one wants to bid for Carbon Credit? Carbon would have to pay token holders to incentivize them to burn their tokens instead, for example, paying token holders additional tokens upfront in parallel to issuing new tokens during expansion. Essentially, the protocol would have to borrow money from the future to do so. This can be compared to the European Central Bank which uses a negative interest rate to incentivize banks to lend out money. However, there is a cost to such policies as it encourages people to spend today on things that might not be justified at the usual interest rate level, and also causes currency devaluation. What I like about Fragments is that it has a reserve that acts as a safety net. The reserve steps in to buy bonds and facilitates the contraction, freeing the protocol from relying on market makers and token holders to enforce the mechanism. A detrimental scenario is when a large decrease in demand is not followed by a large increase in demand, but in the case of Fragments, the reserve would be a primary buyer in the auction, shielding token holders from having to lock up their tokens for a long time. For pegged currencies, that risk is the risk of “sharp market sell-offs”. In the 1997 Asian Financial Crisis, Thailand had maintained the strongest and longest peg to USD compared to other Asian countries. However, it was forced to abandon the peg when foreign investors sold significant amounts of Thai baht, forcing the central bank to counter the market force by buying Thai baht using their reserve. Because the amount of the reserve was too small compared to the amount of debt that Thailand had borrowed internationally, the central bank could not defend the peg. In opposite, Taiwan was immune from the crisis because their central bank had significant levels of reserve to maintain the peg. A reserve is not an end-all solution, but it’s a safety net that enables flexibility in managing any given currency. Fragments has de-risked the risk of market sell-offs by having a more complete suite of tools to alleviate the risk of black swan events. No one knows which protocol will stand the test of time, so as investors, we choose to support projects that have de-risked “the riskiest risk”. If you’re excited to see how these projects unfold, find out here: Basis, Carbon, Fragments. Thanks Adam Nicoletti & Felix Feng for your feedback.